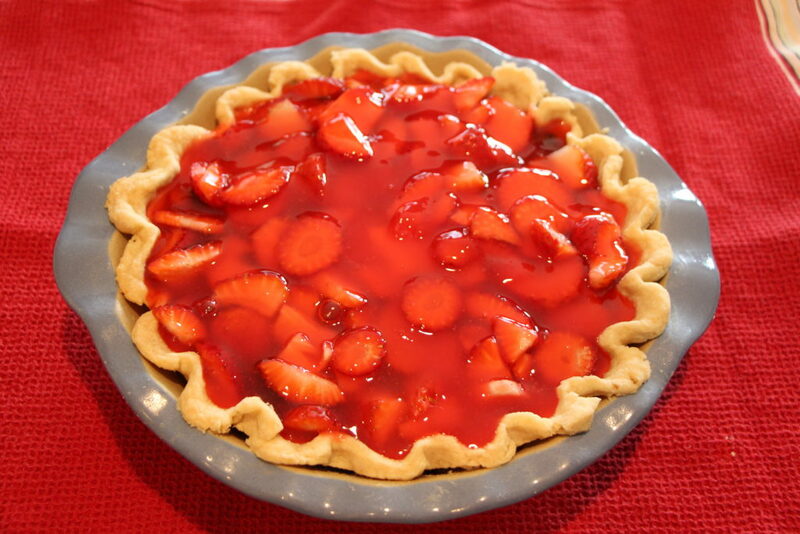 Yum….fresh strawberry pie, with berries now available year round we can have this during any season, but I am sure we would all agree it is best with fresh picked berries. That season will be here around the end of June this year due to our wet and cool conditions now, so in the mean time we can use berries from the store. 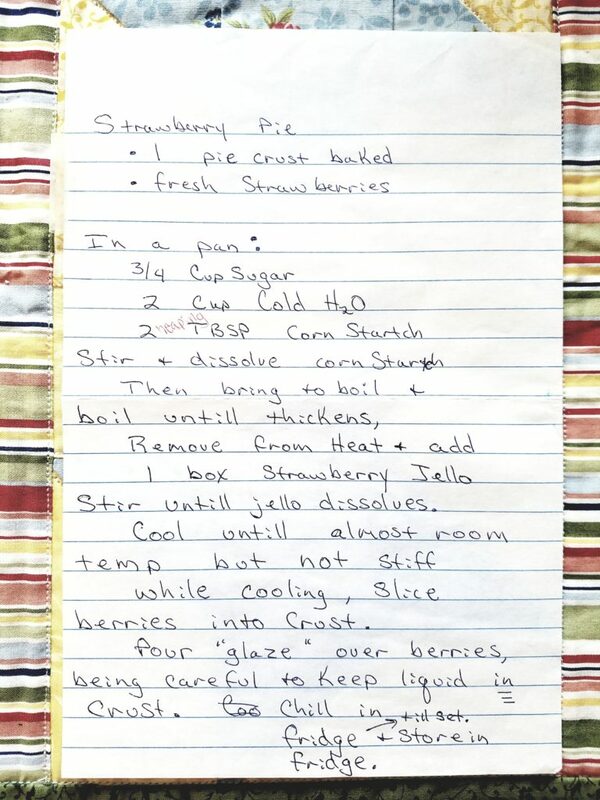 In my blog last week, “What’s for Supper” I made this pie, and here is the filling recipe. 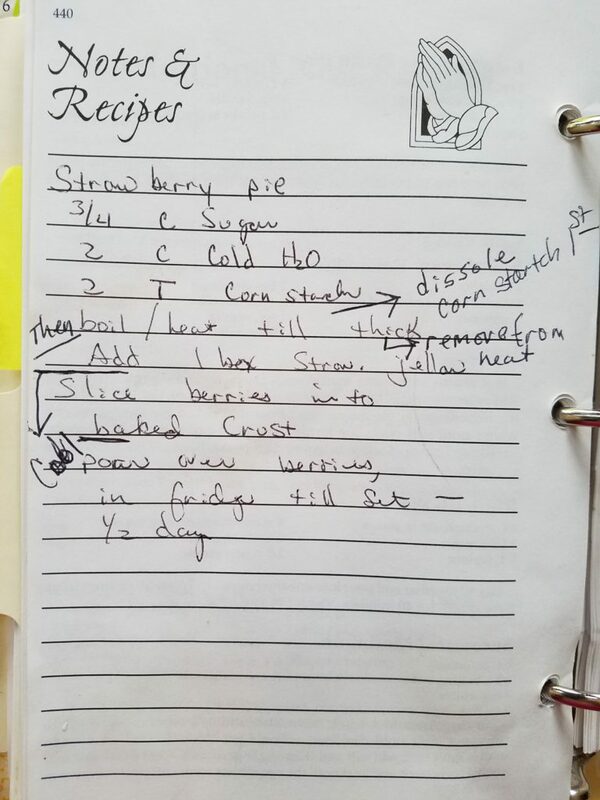 Now, I don’t see a problem with this recipe, the notes to the side were wrote in years ago to help our daughters make this when I was not around, prior to that there was just a list of ingredients. Like many of you out there, There are very few things I make where I follow a recipe, the problem with that is when your kids start baking on their own, they need this. Sure the kids have always been in the kitchen and worked side by side with me, and I just assume then they know how to make something even when there are no directions, just a list of ingredients. Well I learned to start making notes in my recipe books and rewriting my “chicken scratch” notes after what they were trying to make, was not turning out. The pie filling recipe was rewrote a few years ago when Noelle made the filling, I was not at home and the filling did not set. Can anyone guess why? My list reads 2 T cornstarch, well she knew that meant tablespoon, but my tablespoon was a heaping one! She said to me, “Well how are we suppose to know that.” Point taken, so I rewrote this one. Look how clear and spelled out this is with all the steps and all the measurements are included, except how many berries. Note the word heaping Noelle added, as I forgot this again! Well the kids, usually Noelle have since made this on their own and it turns out great every time. It is so nice when someone else cooks and bakes. 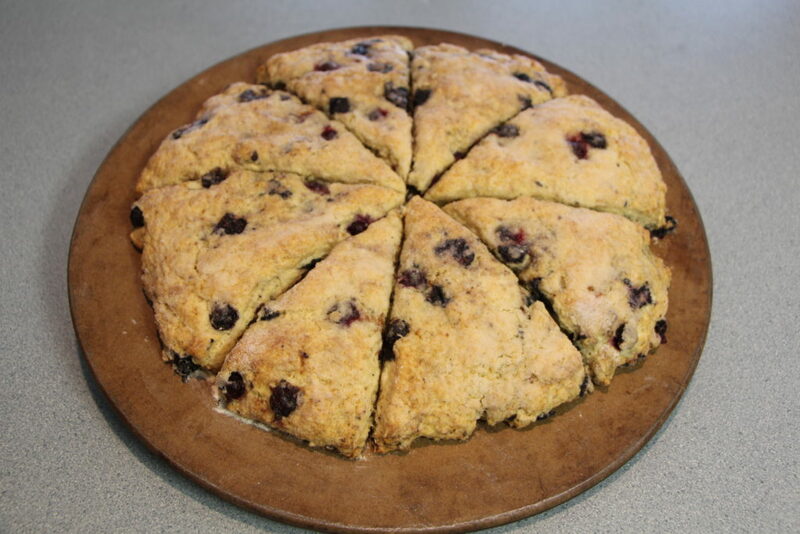 My second recipe to add today is the scones. We never made these at home and none of my aunts make them, but I sure enjoyed a scone and a cup of coffee when we stopped at a small town bakery or if we went out for brunch. I just finally got to the point where I thought to myself, why am I not making these at home. To be honest, it did take me many tries and when you end up with a bad batch it takes me about a month to try again. 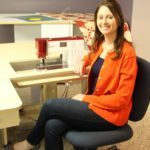 I would guess it took about 2 years of trying on and off to find a recipe I like. The one I use now is a combination of about 3 different recipes, and by the way, it’s not wrote down yet for the kids. 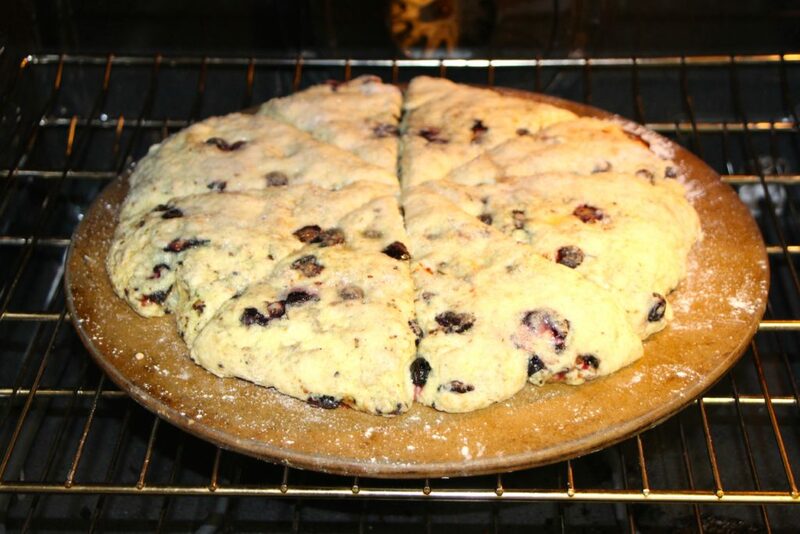 This is a photo of the scones in the oven ready to be baked, this way you have a visual of what I am talking about. As I said in my past blog, I like a scone that has more of a biscuit texture rather that a cake texture, I also like a crust that is almost caramelized on top. Here is the recipe I use. I grate the frozen butter into these dry ingredients and using clean hands, gently toss. Leave the butter chunks intact, when the scones bake, the butter melts, leaving behind small air pockets in the dough and the result is a flakey scone. To this dough I add 1/2 cup sour cream and 1/2 cup milk. Gently incorporate the two, do not over mix. At this point add the desired amount fruit and zest, or anything else you would like. Blueberries and orange zest or cranberries and lemon zest are the two I make most often. You can also add nuts or herbs and cheese if you want a savory scone, just any combination you like. Depending on if you use fresh or dried fruit you may need to add more liquid or flour. The dough really does not stay together, I simply mound it on to my baking stone and pat it out into a circle. I also cut it using a pizza cutter before baking. I then brush the top with milk and generously sprinkle it with sugar. It bakes in a hot oven at 425 degrees until done, maybe 15 minutes until it looks and feels done. If it over bakes it will be dry, under baked, it will be doughy in the center. Sorry I can’t be more specific. You can eat them right out of the oven, but you will need to cut them again. This entry was posted in Uncategorized on May 23, 2017 by Carla. Thanks for the recipe Carla. I just got strawberries so pie soon! !